Islophile Ben Fogle’s second book, Offshore, builds neatly on Teatime Islands in terms of unlocking further the reasons behind his fascination with islands. This time he embarks upon a journey around the coast of the United Kingdom in order to find an island to calls his home. 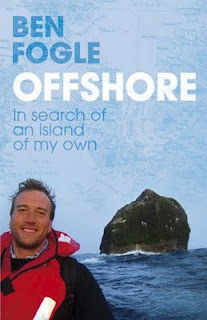 The book begins and ends with Fogle’s attempts to land on Rockall, a mere pebble of an island in the North Atlantic Ocean – an island that is technically British but whose sovereignty is disputed due to purported mineral and pescarian wealth in the area. Along the way there are plenty of small adventures involving the coastguard, storms, helicopters ditching and, amongst other things, a run in with an angry Viking. The main reasons for buying this book were: firstly the Teatime Islands seemed to appeal to my own sense of curiosity about islands and far-flung British imperial outposts; and secondly that Fogle writes in a very accessible style – really the style in which you would expect him to write if you’ve ever watched him presenting on the BBC’s Countryfile or Animal Park. With that said, the book is a lot more stylishly written than Teatime Islands – especially in terms of the phrasing and subtlety with which historical fact is incorporated within his personal narrative. One can only hope that another wind-swept, storm-battered adventure ensues sometime soon as at around two-hundred and sixty pages long, this very easy to read traveller’s tale strangely leaves you wanting more. My rather hap-hazard review of Teatime Islands can be found at: http://ayohcee.blogspot.com/2005/09/book-teatime-islands.html.